Fresh drinking water straight from Cascade mountains to the Bull Run Reservoir, and then to the city streets of Portland. 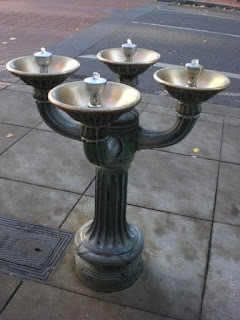 The fountains were a gift from lumber baron Simon Benson, apparently to discourage the drinking of alcohol. Whatever — the water is delicious!